Aliya has tagged me. She wants to know what my secret vices are. Let’s see. Well, I don’t think I’ve anything secret. Don’t think there’s anything people don’t know about. There are fountain pens, which I love. But they’re not really a vice. There’s American Chopper and Deadliest Catch that I love to watch. Again not really vices. And then there’s Big Barn Farm. I first came across it when my beloved and I were in Cornwall earlier in the year. And I have to admit that whenever I happen upon it I do want to see how it ends. And in all fairness, it is good children’s TV. I went to a pub to see friends last night. It was good fun. But one event still has me puzzled. I passed some people, who’d been sitting at the table next to us, in the corridor as they were leaving. There was the polite, and rather northern, see ya from a couple of them, which I returned. And then, one of them, a lady (quite possibly a wee bit tipsy) grabbed my arm and, giggling, proceeded to call me George Michael. Over and over again. She thought it was hilarious. I thought (and still do) it was bizarre, for the simple reason that I look nothing like him at all. Very, very strange. Me, when I got home, not looking like anyone other than myself. Nik, relax, you look nothing like that orange pop-show. Much more manly, for a start! I can’t see it myself! In the eighties, little kids used to run after me shouting Timmy Mallett, Timmy Mallett! Then someone said I looked like Chris Evans. Once, very bizarrely, I was even called Elton John by some drunken idiot. So, okay, I wear glasses. I suppose it’s better than Joe 90. I think you’re a little more Peter Sutcliffe around the eyes, myself. That could be the crazy staring, though.I didn’t tag you – Neil did. He has secret vices. I just have a faint predilection for tucking a blanket around myself on the sofa. 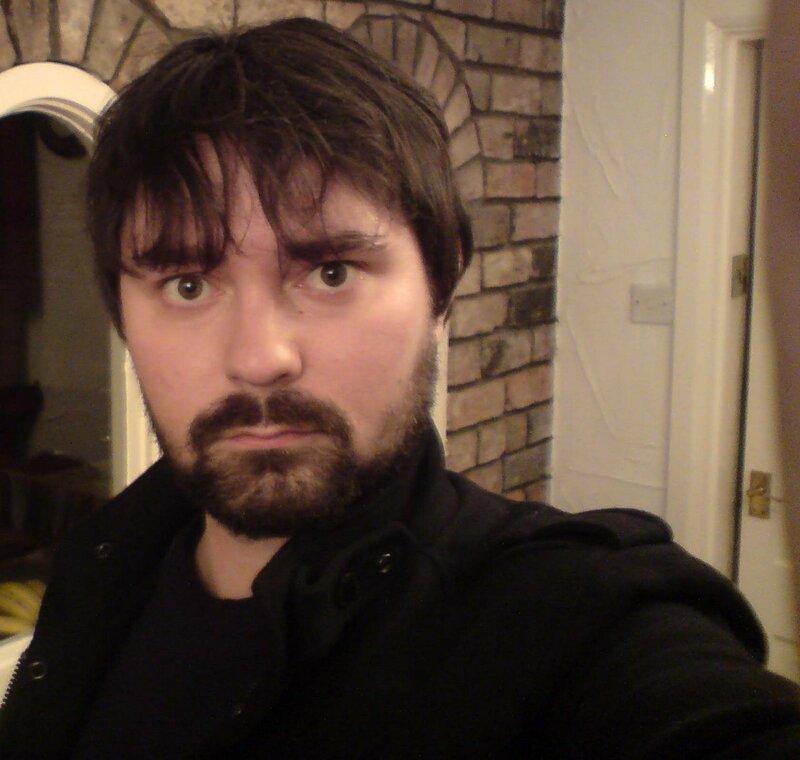 What a nice photo – the beard’s looking good, and the hair.Though you do appear a tad indignant.